Kansas medical license profile (full length) for Ronald N. Yeomans, as of Sept. 2017. Expired Arizona medical license profile for Ronald N. Yeomans. Summary of current Kansas medical license profile (as of 2017) for Ronald N. Yeomans. 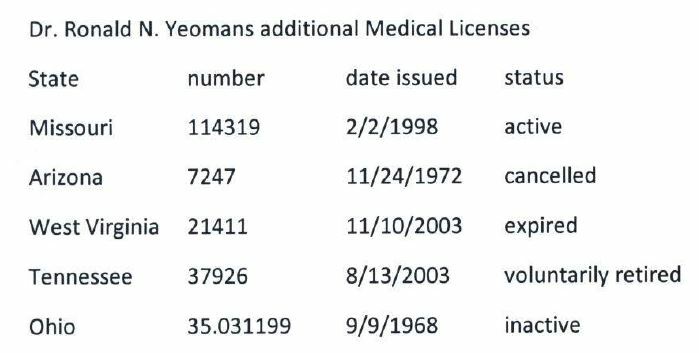 Expired/inactive Ohio medical license profile for Ronald Norman Yeomans. Expired West Virginia medical license profile for Ronald Norman Yeomans. Two malpractice settlements for Ronald Yeomans dating from 1979. Ronald Yeomans has held medical licenses in multiple states, including: AZ, IN, KS, MO, OH, and WV. 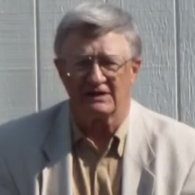 Ronald Yeomans has held medical licenses in multiple states, including: MO, AZ, WV, TN, and OH. June 2011 --- Yeomans sues to prevent legislation that would provide basic licensing and health/safety standards at abortion clinics in Kansas. The clinic where Yeomans works contends that they would be forced to shut down if they needed a license and some safety standards (which apply to other medical facilities to prevent emergencies and complications) and therefore should not have to be under any safety requirements. Thus, women and girls who go to Yeomans' clinic are vulnerable to unlicensed facilities with no safety standards for healthcare or treatment or equipment. 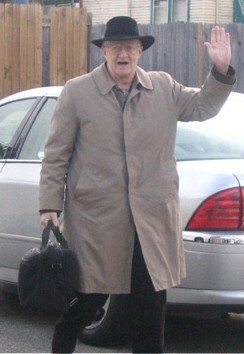 July 2011 - Yeomans contends that renovations to the clinic where he does abortions will be "costly" and therefore they should not have to rennovate in order to ensure safe conditions. Informed Consent form for PP Comprehensive Health. Lists abortionists Irene Bettinger, Ronald Yeomans, Orrin Moore, Andrew Broselow. 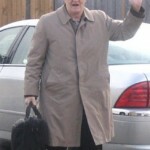 See info on Ronald Yeomans in article. 24-hour informed consent form for PP Comprehensive Health abortion clinic. Lists Irene Bettinger, Ronald Yeomans, Andrew Broselow, & Orrin Moore as abortionists. Report from Operation Rescue featuring redacted images of a sampling of the records improperly dumped at Central Family Medical )also known as Aid for Women.